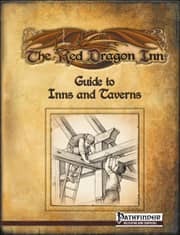 The Red Dragon Inn Guide to Inns and Taverns is a Pathfinder-compatible sourcebook describing how to add inns and taverns, like the Red Dragon Inn, to your adventure! The Guide to Inns and Taverns has information for both players and gamemasters. Players have access to new classes, feats, spells, and magic items, as well as the mechanics to build their own taverns. GMs will be provided with new kinds of encounters, NPC classes, suggestions for building the sorts of encounters that might take place in an inn or tavern, as well as fully fleshed-out taverns and NPCs. Chapters 1 through 10 are for Players and GMs! Chapter 1 "“ Operating Inns and Taverns: This chapter goes over the ins and outs of putting inns and taverns into your game. It covers topics such as who to hire, what sort of entertainment to bring in, and what kinds of amenities you might offer to your guests. Chapter 2 "“ Barroom Brawling: What party of adventurers doesn't get into a scuffle at a tavern eventually? This chapter greatly expands the kinds and uses of improvised weapons, as well as addressing obstacles and potential hazards common to these settings. Chapter 3 "“ Building Inns and Taverns: This chapter provides you with the step-by-step process for building inns and taverns. You'll find detailed information on everything, from choosing locations to thatching your roof, plus how much it will all cost and how long it will take to build or repair almost anything! Chapter 4 "“ Equipment: A tavern wouldn't be a tavern without some tables, chairs, plates and mugs. This chapter goes over all of the items you would expect to find in an inn or tavern, how hard they are to break, and how much it costs to replace them. You'll also find new magic items and variant rules that improve the items made by master crafters. Chapter 5 "“ Drinks and Drinking: This chapter introduces new mechanics that better reflect the effects that a night of debauchery (and the morning after) can have on your characters, with new intoxicated conditions and rules for handling ingested poisons. Chapter 6 "“ Gambling: This chapter covers how to use gambling in interesting ways and introduces Gambling Encounters, a new system for resolving games of skill and chance in your game. Chapter 7 "“ Feats and Traits: This chapter introduces new feats and traits for player characters and NPCs. Chapter 8 "“ Classes: Artisan: This chapter introduces the Artisan, a new player character class that focuses on crafting, trading and dealing with common folk. Artisans are similar to the commoner NPC class! only better! Chapter 9 "“ Baking, Brewing and Cooking: This chapter introduces new rules that cover the crafting of food and drink, as well as enchanted food and drink. Chapter 10 "“ Spells: This chapter introduces new spells that take advantage of the new intoxicated conditions and crafting mechanics. Chapters 11 through 13 are for GMs only! Chapter 11 "“ Non Player Characters: This chapter provides GMs with the tools for making a cast of believable NPCs for the player characters to interact with. It is filled with new NPC classes as well as generation mechanics that fill your campaign with characters who are not just looking for a fight. Chapter 12 "“ Gambling Encounters: This chapter provides GMs with sample Gambling Encounters to drop into your campaigns or use as inspiration.